FRANKFORT, Ky. (AP) -- It's been eight years since the U.S. Supreme Court declared that political spending is free speech. The decision eased the way for corporations, unions or nonprofits to spend massive amounts to support, or more often, denounce candidates in tight races. Citizens United, as the ruling is commonly known, has transformed American political campaigns, most notably over the airways. But the flood of cash also pays for an army of field offices, canvassers, data miners and even good-old-fashioned opposition researchers, in a system designed to influence voters around the country. Today, a considerable portion of campaign activity voters see is paid for by donors who live elsewhere and, in many cases, contribute to some kind of political committee. Some of those committees must disclose where their money comes from; but others, the so-called dark money groups, don't have to identify their sources of income. Certainly candidates are raising plenty of money, but they are subject to comparatively low donor limits. A single donor can give a single federal candidate no more than $2,700 in each round of an election cycle (the primary, any primary runoff and the general election). Party committees have much higher limits. Democrats' enthusiasm this cycle has used that system to propel more than 100 House candidates to fundraising advantages over their rival GOP incumbents. But Republicans are more than making up for any gap through super PACs. The Congressional Leadership Fund, or CLF, for example, has raised more than $126 million, including huge checks from GOP megadonors like casino magnate Sheldon Adelson and his wife, Miriam. They each gave the fund $12.5 million this spring. To be clear, there are liberal megadonors, as well. 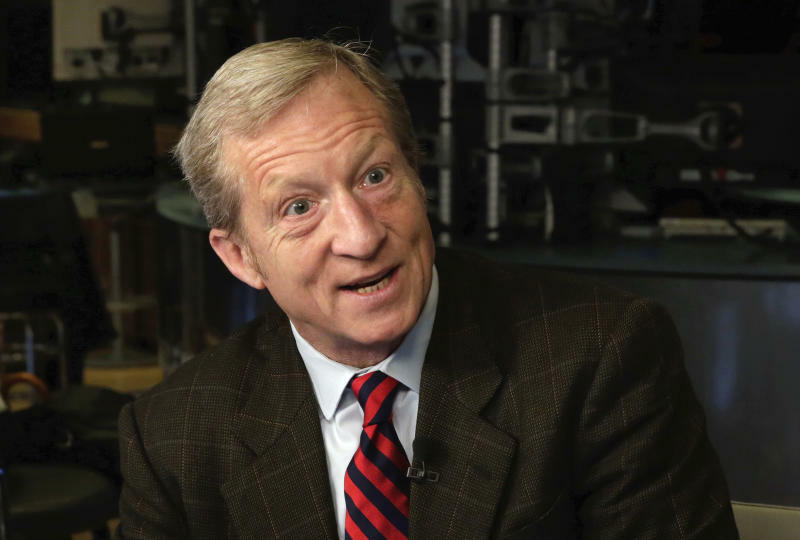 Billionaire environmentalist Tom Steyer is spending tens of millions of dollars through one PAC that's pushing for Trump's impeachment and another that's trying to drive up millennial turnout. The result of this financial flood is a cacophony of messaging on the airwaves and in digital advertising that voters must navigate in the closing weeks of the campaign. EDITOR'S NOTE: Associated Press reporters are on the ground around the country, covering political issues, people and races from places they live. The Ground Game series highlights that reporting, looking at politics from the ground up. Each week, in stories and a new podcast , AP reporters examine the political trends that will drive the national conversation tomorrow. Everyone complains about big-money campaigns — particularly outside money — and the negative advertising that follows as a result. But campaigns and outside groups keep using them for one reason: They work. And as digital advertising and data analyses of voter tendencies gets more and more sophisticated, political organizations are dedicating more and more money to those efforts. Quite often, that process starts before candidates' own fundraising gets off the ground. For example, independent groups like Republicans' Congressional Leadership Fund and Steyer's NextGen America sometimes set up shop in a district or state long before general election campaigns. A good example comes in Kentucky's 6th Congressional District, a Republican-leaning district where Democrats are making a strong push. Republican Rep. Andy Barr easily won his third term two years ago, but the district has alternated between the two major political parties five times since 1978, and Democrats have long seen Barr as an inviting target. GOP players in Washington fought to back their candidate, with Barr's district drawing early investments from CLF, the GOP super PAC working to defend Republicans' imperiled House majority. CLF has reserved more than $2.6 million in television air time in the district, including at least $940,000 in television advertising spent to criticize his Democratic opponent, former Marine Corps pilot Amy McGrath. Barr also has benefited from National Republican Congressional Committee spending and ad buys from the American Bankers Association and the National Association of Realtors. Democratic PACs have answered, even if in smaller amounts. For her part, McGrath has been a fundraising juggernaut. Her $6 million-plus haul is a staggering sum for a House race. Barr has raised $4 million, but has been far more dependent on PACs (more outside money). To be clear, lots of McGrath's money has come from individual donors from outside the Kentucky district. But that kind of outside money flows directly to the candidate, who then decides how to spend it, as opposed to the third-party spending that neither candidate controls. Spending on her behalf has meant that McGrath has had no trouble keeping her pledge not to run attack ads. She can leave the attacks on Barr to the independent spenders like the House Majority PAC, which is Democrats' counter to CLF. Whatever the results on Nov. 6, there will be plenty of crowing from the outside groups that invested heavily to shape the Congress they want. CLF's overall spending could top $150 million. The House Majority PAC could reach about $60 million. The various official party committees will add several hundred million more to the House and Senate ledgers. Of course, the losers aren't likely to take the blame. For them, the voters will have decided.